It's the best early snow the ski area has had in decades, according to Dave Wilson, Ski Area Manager for Mt Hutt, which is aiming to open two weeks ahead of schedule, this Saturday, May 30th, subject to weather conditions. "We've got awesome snow conditions so have decided to open early for some May skiing. But it's been a big call to make," he said. "There are huge logistics involved in opening a ski area ahead of schedule. We need to ensure our suppliers can meet our deadlines, go through all of our health and safety checks and ensure we have enough staff to provide the best possible snow experience from opening day. A lot of staff have changed their plans to get here early which is humbling. We're also bringing in staff from our sister mountains (Coronet Peak and The Remarkables) in Queenstown to help us out." Mt Hutt received more than 170cm (nearly six feet) of snow in the first fortnight of May and has had regular falls since. For non-New Zealanders there's an added benefit to heading south of the equator this year - the lowest prices for many years as well as the great snow, because the New Zealand dollar has fallen by more than a third against the Euro and the US Dollar and is even down against the British pound. Meanwhile more fresh snow fell on other New Zealand ski areas up to last weekend, which coming on top of consistent snowfall throughout May, is delivering spectacular pre-season conditions. Coronet Peak ski area, scheduled to open in less than two weeks on Saturday 6 June, received 50 - 100cm of snow over four days resulting in an 80cm base at the top of the mountain and a 50cm base at the bottom. Hamish McCrostie, Coronet Peak Ski Area Manager, said they couldn't have asked for a better build up to season opening. "It's just fantastic. We've had consistent snow falls since early May which is unusual but very welcome," he said. "We've started packing the snow already which bodes well for a really good base for the season to come." Across the valley at The Remarkables, the ski area received 45cm of fresh snow in 48 hours and has received 150cm over the last two weeks, resulting in a solid 120cm base across the mountain. 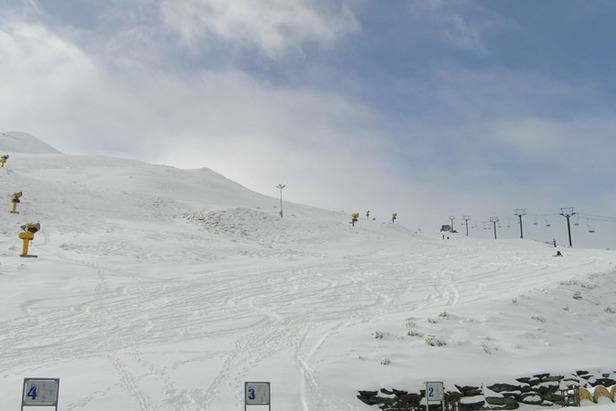 The Remarkables Ski Area Manager Ross Lawrence said he was excited about current conditions stating "it is the best start to the season anybody can remember for many years." "These are magic conditions for this time of year so we're all hyped up for some superb skiing and riding from opening day," he said.